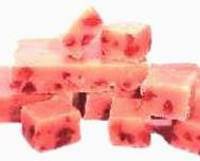 Why not make this pretty Cranberry Fudge during the holiday season, and give it as gifts to friends and family. It's something different, and everyone will love it. Line a 9x9 inch pan with aluminum foil and set aside. Place white chocolate chips, orange extract, dried cranberries and marshmallow cream into a 3-quart glass bowl; set aside. Heat milk and cranberry juice in a saucepan on medium heat until warm; add sugar. Bring to a rolling boil, stirring constantly with a wooden spoon. Continue to boil for 8 full minutes**, or if using a candy thermometer continue boiling until the boiling temperature reaches 235 degrees F, but do not exceed a total of 9 minutes at a rolling boil. Remove from heat and add butter. Stir until dissolved. Pour hot mixture over white chips, orange extract, and marshmallow cream without scraping the sides of the hot saucepan. Mix thouroughly until the chips are melted, stir in chopped nuts if using, and place into prepared pan. Cool at room temperature. Chill in refrigerator prior to cutting. Remove from pan, remove foil, cut into squares. *NOTE: Cranberry Juice Concentrate can be found in the fruit juice aisle at your supermarket. It comes in a 12 oz. can that looks like a soda can and is reconstituted by adding water. If you can't find it, you can use frozen cranberry juice mix. Let it thaw and use 1/3 cup. Use the rest of the concentrate to make cranberry juice to drink with the fudge. **NOTE: Adding the cranberry juice in the middle of the 8 minute boil is an easier way to adjust the boil time without it being complicated. Boil for 4 minutes, add the cranberry juice, and then boil for 4 more minutes. Makes a 9x9x2 inch pan of fudge.